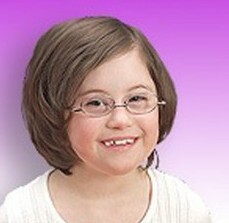 “Erin’s World” is the frame line specially designed to fit children with Down syndrome superior to the typical frame. Unlike other frames, the bridge is adjusted to fit on their smaller noses and the temples (some people call them arms) are designed to help keep the glasses from constantly slipping. Erin’s World frames are available in a variety of sizes and styles to fit toddlers to adults. We stock a selection of these frames in Acomb (York) and Castleford. With a pair of Erin’s World frames your child will no longer be constrained by their glasses. They will be able to explore the world freely and clearly without wearing glasses that are too big or are constantly slipping down their nose. These frames are made with your child’s unique needs in mind and solve the problems that regular eyeglasses never could. Why do our children with Down syndrome need special glasses? 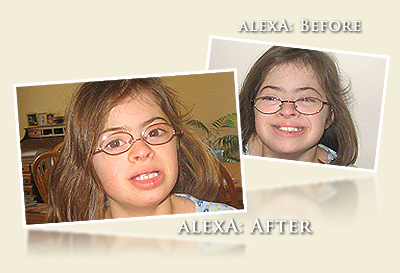 Children with Down syndrome have easily recognizable facial features, including very small noses, shortened depth from the eye socket to the ear and especially close set eyes with wide faces. As a result, “typical” glasses slide down constantly, fall forward and bow out at the temples. Erin’s World frames are the only frames on the market today that address these special needs. What percentage of children are affected? 87% of those diagnosed with Down syndrome, will need corrective eyeglasses before the age of 3! How do our children manage now? In reality, they are not managing; it is a constant daily struggle for our children to see properly. Chances are, when you see a child with Down syndrome, their glasses are down on the tip of their nose and they tilt their head back to see through the lenses. Either that or they simply do not wear them at all, dramatically hindering their ability to function in school, the community and at home. Erin’s World frames give our children the opportunity to see properly and without the constant struggle of frames that just do not function correctly. It’s all about the numbers. There are not sufficient quantities of patients to warrant interest by the major frame manufacturers. Because of the research, design, prototyping and patent investments, large for-profit corporations cannot justify this product line. How do you know this design is better? Erin’s World was developed by an experienced optical professional. More importantly, the designer has benefited from the priceless input of parents and caregivers who deal with these special issues everyday. Do Erin’s World frames come with a warranty? VisionCare Optometry warrant Erin’s World frames for a year from initial purchase. For children, under the NHS, they are entitled to replacement of damaged or broken lenses.